An Eye Shadow Quad in four shades: Ron Ron Run, Spoiled Rich, Pin-Up Purple and Gravel. The highly pigmented powder formula applies evenly, blends and builds beautifully. Limited-edition Archie's Girls packaging. 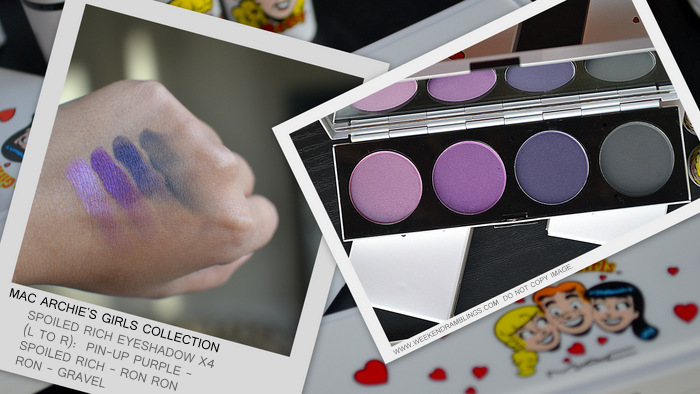 It's been a while since the MAC Archie's Girls Makeup Collection launched, and while I picked up the Spoiled Rich (Veronica) eyeshadow quad when it was released, I haven't had the time to post a review on this until now! I guess I still have a bit of time remaining since the collection hasn't yet launched in places like India, but I figured I better hurry up and post it at least now! Like everything else from the Archie's Girls Collection, the Spoiled Rich Eyeshadow Quad too features limited edition packaging in white. This quad features 3 shades of purple - Pin-up purple, Spoiled Rich, Ron Ron, and a charcoal matte - Gravel. Scroll on for photos. This quad include 2 frosts and a satin, but they seem almost matte in their dryness. The colors are all quite pigmented, and for anyone looking for a travel-friendly palette and loves a good purple smokey eye, this palette might seem a match made in heaven. The eyeshadows, though, can definitely do better in the quality department. They seem quite dry, tend to fly around a bit, and almost completely disappear with even the lightest blending. I would definitely recommend a sticky base like a paint pot or a jumbo pencil or something to help the shadows stick on to the lid better and keeping blending to the bare minimum. I found it much easier to just toss the brushes and use my fingers to pat the shadows on to the lids - the colors do turn out surprisingly pigmented this way, and I just do a mild blending around the edges to soften any harsh lines. That said, I do find the staying power pretty good with a primer and/or with layering the shadows. Here's a look at the swatches, and how it looks on me. Overall, I liked the colors that MAC has added in this palette, and this should appeal to anyone who loves a stronger eye makeup. I do think that it might be worth checking out similar colors in MAC eyeshadow singles and making your own palette since the quality might be better that way. The colors are sooooo pretty.. I love your makeup !